Damp snow Thursday night didn’t keep parents and families away from Fall Family Weekend. During the two-day event, families met with their students’ teachers, listened to a cappella music and watched previews of dance and theater productions in a special all-school assembly, and heard a state-of-the-school update from Head of School Robert W. Hill III and Dean of Students Kathy Noble. An international family reception was held on a snowy Thursday night at the home of Mr. and Mrs. Hill. On Friday afternoon, around 100 parents and family members joined the Hills for a reception at their home. Families watched a rollicking production of Shakespeare’s The Comedy of Errors on Friday and Saturday nights (read more here). 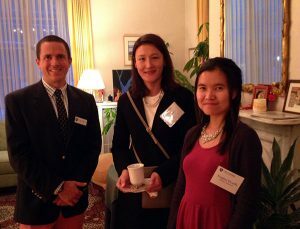 Parents of international students gathered at the home of Head of School Robert Hill. Spectators witnessed Wildcat play in several sporting events on Friday evening and Saturday afternoon (see athletic results here and athletics photos in our Flickr albums). Williston’s Shaler Invitational cross-country race drew 17 teams—more than 550 runners—from around New England. Williston’s boys team came in fourth out of 14 and the girls team came in fifth of 13. 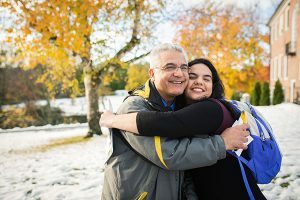 For many parents, attending a panel hosted by the Williston College Counseling Office helped start (or continue) the search for the higher education institution that will be the perfect fit for their child. The panel, introduced by Williston Director of College Counseling Catherine McGraw, included Matt Malatesta, vice president for admissions, financial aid, and enrollment at Union College; Gil J. Villanueva, associate vice president and dean of admission at the University of Richmond; and Michael Geller, the New England regional director of admissions/associate director for regional programs at the George Washington University. 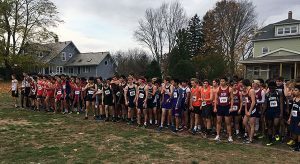 Boys cross-country teams line up at the Shaler Invitational. Malatesta taught high school social studies at independent schools in New York and Pennsylvania before taking a turn toward admissions. He was director of financial aid at Hamilton College before returning to work for his alma mater, Union College in Schenectady, N.Y.
“There’s great success to be had out there,” Malatesta told the audience, and encouraged students and their parents to look for “programs, philosophy, and opportunities” that line up with their needs and values. Before joining the University of Richmond, Villanueva served as dean of admission and chief admission officer at Brandeis University. He previously worked at Bucknell University and Harvey Mudd College. 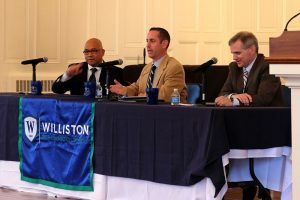 Matt Malatesta of Union College, Gil J. Villanueva from the University of Richmond and Michael Geller of the George Washington University talked college admissions. Villanueva talked about the three Rs of the college search process: reflection, research, and resources. He added, when visiting schools, don’t pack too many visits in a single day. Seeing one college or university per day will allow a prospective student to really take in the atmosphere of an institution. McGraw said she was delighted by the high turnout to the panel, which had to be moved to a larger venue to accommodate everyone who signed up to attend. “We were so excited by the level of parent engagement in the college-search process,” she said, adding she appreciated both the honesty and the levity expressed by the panelists. “We definitely anticipate holding this event every year,” she said. The finish line is in sight on a project more than five years in the making, as Williston’s Physical Plant staff puts the final touches on a new 3.1-mile cross-country running course this summer. 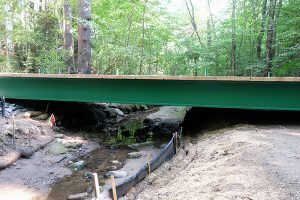 Crews with a large crane installed a short span over a small stream in early August, representing the project’s most intense engineering work. The new route, which will be composed almost entirely of grass and dirt, will replace a mostly-paved course that has been used by Williston cross-country runners since 2003, according to Girls Cross-Country Coach Greg Tuleja. “Our current course can seem more like a road race than a cross country race, although the runners love it because of the fast times,” he said. The majority of that course passed through property belonging to the City of Easthampton’s Nonotuck Park. This occasionally posed conflicts with events hosted by the city in space the course occupied. Automobile traffic in the park was also a concern. Now that the bridge is in place, work remains to clear the path. The trail has been plotted on a map, and on a recent day, Jeffrey Tannatt, director of Physical Plant, was in the woods with a clipboard and schematics, on what will soon become the course. 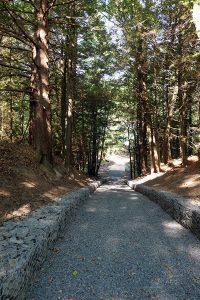 On the wooded portion of the path, crews will clear a trail 6-feet to 8-feet wide, then cover any exposed tree roots with 3/4″ crushed stone, followed by wood chips for a level surface, according to Joe Zewinski, grounds manager. On the sides of the bridge, workers will install railings or a bumper to keep runners safe, he added. Charles McCullagh, Williston’s chief financial officer, said he hopes to have the new course completed as soon as possible, and said he believes it will be ready for the annual Shaler Invitational, a big meet Williston hosts in late October. The new course will cover trails in woods behind Galbraith Fields, and on fields around the school’s 8-lane track, tennis courts, and soccer fields. “When it’s done it’s going to be one of the nicer courses that students will see in the course of a season,” McCullagh added. The new course is one of a number of athletic facility improvements the school included in its campus master plan, which is being updated. Other projects in the updated plan include expanding the weight room in the school’s Athletic Center and making renovations to Lossone Rink and Galbraith Fields. Communications Intern Nate Gordon ’16 contributed to this story. 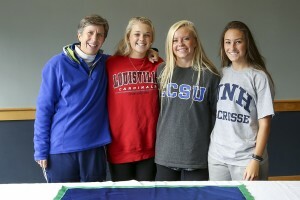 On February 3, 2016, four Williston senior athletes signed letters of intent to play college-level sports: Emily MacDonald ’16, of Ludlow, MA, signed to play soccer with Assumption College in Worcester, MA; Caroline Wysocki ’16, of Agawam, MA, signed to play soccer with the University of New Hampshire in Durham, NH; Aaron James ’16, of Amherst, MA, signed to play soccer with the University of Virginia in Charlottesville, VA; and Nick Garofano ’16, of Yorktown Heights, NY, signed to play lacrosse with the United States Military Academy in West Point, NY. 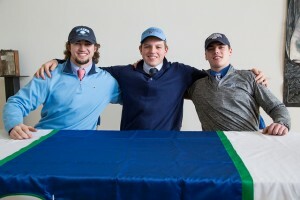 View photos from the signing ceremony on Williston’s Flickr site. Coach Jen Fulcher can’t walk into a room without spreading some of her infectious enthusiasm. Imagine her excitement, then, when three of her top lacrosse players made commitments to top Division 1 programs this week. On Wednesday, for a pre-signing ceremony with one of her athletes, Coach Fulcher was running around giving everyone high fives. When that athlete returned to make her formal commitment with two teammates during a ceremony on Saturday morning, Coach Fulcher was in the Cox Room cheering them on and dispensing hugs. Since 2008, Coach Fulcher has guided the lacrosse team to three undefeated seasons. Last year, the team finished with a 12-2 record, missing only three goals over the course of the season. It’s no wonder that seniors Meg Szawlowski, Chloe Harris, and Rylee Leonard all cited their coach—and her enthusiastic one-liners, such as “solve the problem” and “never let them see you sweat”—as a driving influence in their athletic success. Coach Fulcher, they said, is a major reason they will spend next year playing at Central Connecticut State University, University of Louisville, and the University of New Hampshire, respectively. The quarterback, the tackle, and the linebacker met in the Grubbs Gallery on a bright winter afternoon for one final celebration of their Williston Northampton football careers. The three postgraduates clapped each other on the back and hugged the friends and family who had filled the gallery in their honor. Then, one by one, they sat to sign National Letters of Intent to their respective schools, sending off National Signing Day 2015 in style. The quarterback, John “Johnny” Aylward (Tewksbury, MA), committed to Saint Anselm College; the tackle, Alex Ganter (Lynnfield, MA), to University of Rhode Island; and the linebacker, John Kay (Hingham, MA), to University of Maine. All three football stars are headed to up-and-coming programs where they hope to have an impact.